Peace signed between enemy powers and Ukraine Rada; borders of new State determined, and part of Poland and Grodno included in it. General Averescu forms a Rumanian Cabinet. Foreign Office announces embargo on Dutch commercial cables provisionally raised. Germans drive in British advanced posts a short distance on a front of 700 yards near the Ypres-Staden railway. Two air attacks on the Kentish coast; one machine gets over the land, but is forced to descend, and crew captured; no casualties. Peace negotiations under presidency of Herr von Kühlmann opened at Brest-Litovsk. British capture La Boisselle, and part of Ovillers; French take Chapitre Wood, Feuillères, Buscourt, and Flaucourt on the road to Péronne and Assevillers farther south; total prisoners 12,300. Fighting at Verdun; Germans take and lose Damloup Work. General Evert breaks through Hindenburg‘s front at Baranovitchi and takes over 4,000 prisoners. Belgians defeat Germans at Biramulo, east of Usumbura, East Africa. Franco-British advance continues; British take Fricourt and progress near La Boisselle; the French take Curlu and Herbécourt, four miles from Péronne; total prisoners 9,500 to date. Russians take the offensive at Smorgon and Baranovitchi; German lines penetrated. Germans make some progress in the Lutsk salient. General Smuts reports British occupation Bukoba and Karagwe, East Africa. Hindenburg‘s forces penetrate Russian trenches at Smorgon, but are driven out again. 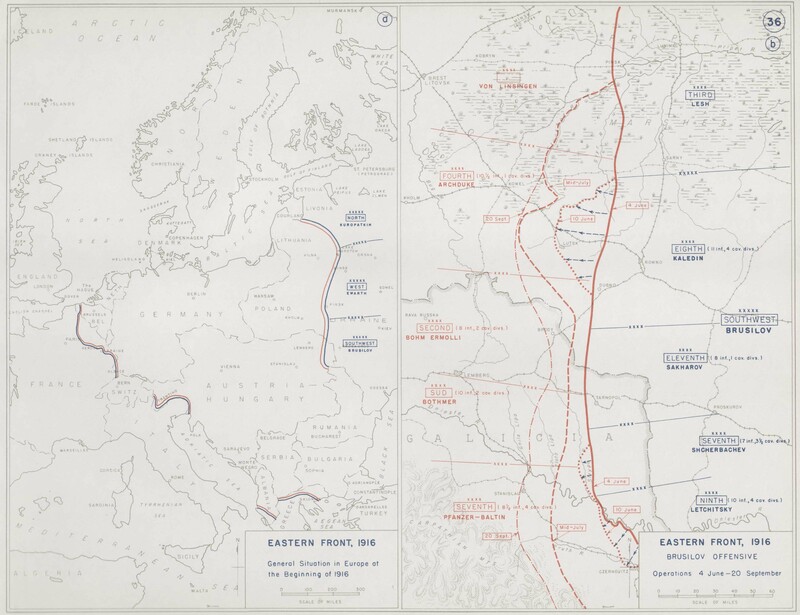 Russian advance continues; another 6,000 prisoners; Russian attack on German front north of Baranovitchi. Canadians recapture old positions at Zillebeke. Sir Percy Sykes and a British column enter Kerman, Southern Persia. British air attack on camps and aerodrome at El Arish and Bir Mazar. General Smuts reports capture of Wilhelmstal. The King visits the Fleet.